Part of a recently renovated and restored period townhouse, which has been converted into just 5 independent suites, the apartment is perfectly located in fashionable Kemptown, within easy walking distance of all that Brighton has to offer, just a couple of hundred yards from the Pier, and a few minutes from the Lanes, the Pavilion, North Laine and the conference centre. The area is very well served with bars and restaurants, but the apartment is in a quiet and peaceful street for the best of both worlds. The apartment itself is beautifully decorated with a modern shower room en-suite and a small kitchen area. There is seating for both relaxing and dining, and a flat screen TV. The kitchen is well equipped and all cutlery and crockery etc. is provided. All linen and basic toiletries are provided also. We have negotiated discounts at a number of local businesses, including the best breakfast in Brighton just 100 yards from the door, and a local gym so you can work it off later! 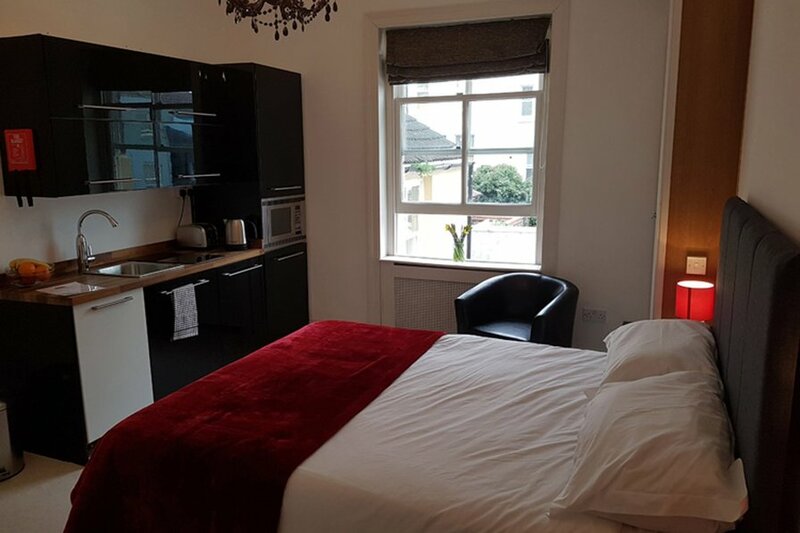 There is a resident manager who can assist you with any special requirements, or just offer local knowledge so you can make the most of time in Brighton.